Lee Mullican, Peyote Candle, 1951, oil on canvas, 50 x 35". 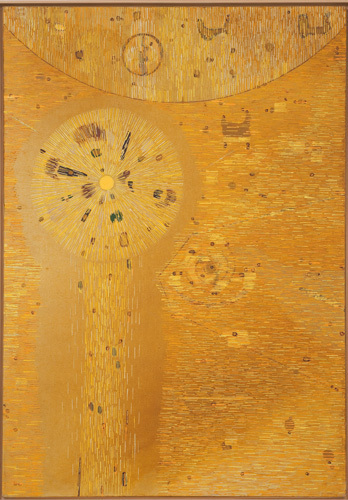 Though not officially related, Lee Mullican’s luminous paintings from the 1950s serve as a fitting prelude to “Pacific Standard Time” (PST). Typically using the edge of a palette knife to apply hundreds of blunt lines of oil paint, Mullican built the surface of each canvas into a tactile and layered field of pulsating colors including gold, orange, deep burgundy, and olive green. Perhaps most striking are two works from 1958 that discard color in favor of an impressively wide range of whites. Several compositions draw on Native American motifs and symbols of ancient cultures that call to mind the work of Paul Klee, who, like Mullican, was interested in the unconscious and the possibility of a universal visual language. While signs and symbols are evident in some works, Mullican for the most part suggests more than he represents. In many of the paintings, areas of vivid hues merge en masse and then seem to shift or break apart into dots, arcs, swirls, and sinuous lines that recall aerial views of landscapes, much like those Mullican saw firsthand through the windows of military planes while working as a topographer during World War II. Dedicated to allowing the unconscious to guide his process, Mullican offers a visually eloquent embrace of the oft-maligned and vastly misunderstood concept of the spiritual in art. The criticism of the spiritual has occurred alongside a widespread embrace of conceptual approaches to art, which has inadvertently cast aside other forms of visual cognition, including sensory awareness and dream states. Mullican’s paintings call for a broader exploration of human consciousness, providing an opening for his exhibition not only to preface PST but to galvanize new artistic investigations into the metaphysical and transcendent.